Read the Bible indiscriminately and you’ll get a mixed message. You’ll take on board laws that were never meant for you and you’ll end up confused and lukewarm. You’ll fall from grace and cut yourself off from Christ. The best way to read the Bible is through the lens of Jesus and his finished work. When the Galatians fell into error Paul reminded them that “before your very eyes Jesus Christ was clearly portrayed as crucified” (Gal 3:1). A clear revelation of the cross is the best protection against falling from grace. The cross changed everything. Prior to the cross everything pointed forward to Jesus and His redemptive work. Everything after the cross celebrates His finished work and invites you to rest. Read the Bible through the lens of the cross and you will see that forgiveness is not something God does, it’s something he’s done! Help spread this good news and keep E2R ad-free by supporting us via our Patreon page. 18 Comments on Are We Completely Forgiven? So many people I know found Grace after coming to the end of their rope and giving up trying to be good. For me… I rejected God… walked through a door and found myself in His House… and surprised as hell… with wobbly knees to boot. another mind renewing post! @read the entire Bible through the lens of Jesus and His finished work. *absolutely right! 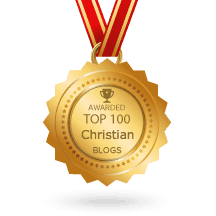 I recently came across this website a few months ago and I just wanted to let you know that the things you have written about the grace of God and the incredible work Jesus accomplished on the cross have truly blessed me. God is using this site and I look forward to reading new posts whenever you put one up. Hi there Paul. Just wanted to ask a few questions. Okay. So God’s love can never be earned, or there’s nothing we can do for God to stop loving us. But, we need an effort/action on our part for us to “feel” that love, for it to manifest within us, right? A responsibility? Or is it not? If so, then what is it? From what you have written it seems to me that you are so caught up in intellectual understanding to the point of confusion. Try giving your intellectual brain a rest. You can’t know God’s Love with your brain. It’s more something that comes from within or from the heart. Try spending some time daily in quiet meditative prayer. Still your body & mind. Take a scripture (whatever speaks most to your Heart about God’s Love for you. ), mull it over in your mind & heart, & tell the Lord that you know this intellectually but you’re having trouble knowing it with your heart. Ask the Lord to give you revelation. Keep an open eye and a listening ear. Look for even the smallest things of evidence of his Love for you and give praise and thanks in meditation and throughout the day. It may come in a blast(but don’t get discouraged if it doesn’t) or it may come little, by little, by little until one day, you just Know. I think for most people it can take a long time so be patient & persistent. It’s obvious that you look up to Paul, but he didn’t get to where he is over night so don’t get frustrated with yourself if all this takes time. . I want to Know everything NOW too HA!HA! but it doesn’t usually work that way. Yet God is Blessing us all every moment of every day whether we realize it or not. Try to rest your heart in that. We don’t need to know all the details & definitions as much as we need to yield, believe & receive with Thanks. The Lord’s just waiting for us to open up and receive all that is already there for us. That is his will and his pleasure. Try this post. You can find everything in the archives. Abraham’s seed Jesus was the promise from God. Abraham believed God and it was reckoned unto him as righteousness long before the law was given. The bible says that Jesus was slain before the foundation of the world. So in the plan and foreknowledge of God He had allready provided the way out for man. That is why we will see Abraham in heaven. 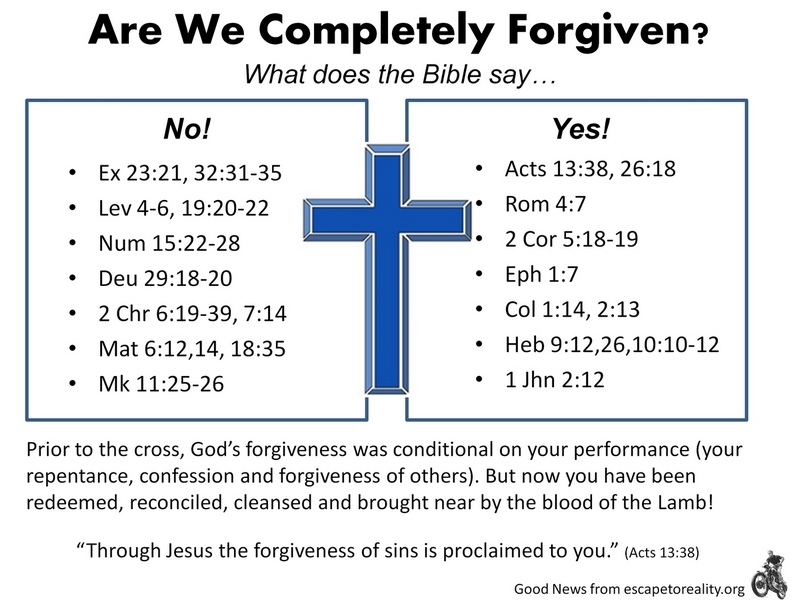 You say prior to the cross forgiveness was conditional on repentance, confession and forgiveness of others but now this has changed ??? It hasn’t changed. 1Jn1vs 9 says if we confess our sins…. James 5:16 also says …Therefore confess your sins to each other and pray for each other so that you may be healed. Beki, the cross changed everything. Please see my separate posts on 1 Jn 1:9 and the parable of the unmerciful servant. Many of the teachings of Jesus were pure law meant for those under the law. More here. Thank you for speaking truth into my life. I way too often allow condemnation to creep in, focusing on my shortcomings instead of Christ’s righteousness. I asked God to show me truth and abudant life in Him, and He led me to this site. Everything after the cross celebrates His finished work and invites you to rest? You should read the entire Book of Revelation. So many believers are confusing themselves and othets by not accepting God’s revelation of grace.My question to these is if God is God. Then why can’t God do something without our human help? Why on earth would the Creator need His creation? Isn’t rather silly and presumptuous for the most powerful being to be so weak that He needs our weak and frail human help? I most gratefully thank God for this platform where we can graciously share our thoughts with one another, learn and also accommodate one another our different levels of understanding notwithstanding. Heaven will honestly be a beautiful place to be. May His grace keep us till He comes for us, amen.